It is time to embrace your comeback! But what does that mean? Let’s start with a story. Before my creative passion hit, I created for myself. I created because it brought me joy. I didn’t create to sell. I didn’t create to bring other people happiness. I created because it was my passion. My audience started tiny, solely composed of close friends and family. Nothing was really planned in advance simply because I was just creating and doing what I enjoyed with passion. I didn’t worry about what other people thought or hole myself in a corner and worry about trying to impress anyone. I was creating for the people who knew the real me, the in-person me. Then it progressed it to a business filled with love, hope and possibility. I was no longer creating for family and friends but to creating for the masses. I started to people-please and my passions went from creating from what’s in my heart, to creating what others are expecting from me. Owning a business is part pleasing others, but not to the sacrifice of losing your passion. That is the fire that started and the fire that will keep you going! You must continue with passion – you must do with your soul! I started creating less and less and giving more and more – all to the detriment of my personal and family health. So what do you do when your passions don’t feel fun anymore? When you hear the tiny echo of your soul telling you that you’ve strayed from your true heart. I am thankful for the life that I have been blessed with! But it got overwhelming. I took on to much. I created for the dollars and no longer for the reason. My reason was to touch and reach people’s hearts and souls. It took a back seat and it was beginning to hurt. I had a greater purpose and I wasn’t fulfilling it. Everything around me started falling away. I was really confused. Confused trying to figure out where this life was headed. I was mourning the past version of myself that I held on to so dearly. The me that carried sparks of passion into the future and that I had let die. So I began surrendering. I began to recognize that my past steps may look nothing like my next steps. Life doesn’t always take an orderly linear fashion and that is hard to grasp. My life was taking a turn and I didn’t know how to approach that turn. I began to shed some heavy skin that brought me down. I take deep breaths daily knowing that I don’t know what my next step will look like or that if I will even be able to take the right step. I reluctantly admitted that I had no clue where in the hell I am going. This is where the comeback for me and you begins! Even if I don’t know what the final result was going to look like. Your comeback isn’t pretty and it isn’t easy. You need to start slow. I am bringing you alongside – those that support me and love me no matter what the end result looks like. I am wiping my slate clean and only writing what my hearts desires. So how do you embrace your comeback when your passions have turned into a grind? Get clear and real with your feelings – even when they hurt like hell. You may have to remind yourself 1000 times a day that you are worth it and that following your heart is not selfish. You are a fascinating person, just like we were all created to be. Your story is going to be vastly different than everyone else’s and that’s the way it’s supposed to be! My story is not your story and your story isn’t mine. If you want your story to be magnificent, you need to begin by realizing that you are the author and only YOU can make it a best-seller! When you get real with your feelings, then you can get real with your goals and where you want to be headed. Understand that you don’t always need to know what my next big thing is. You may wake up tomorrow and not know the answer of how to move forward – but you WILL take the small steps to try to get there. Today may be the completion of a SMALL thing and that’s OK. The smallest, most microscopic steps are sometimes the ones that take you the furthest because that’s when you fought the hardest. You chose to go forward and not fall back. You are tuning into your hidden, wild heart! Learn to enjoy the rain knowing that there is a rainbow to be seen when it’s all over. Let the rain give you a sense of mental clarity. You are going to have days that are torrential downpours and that’s healthy. Yes, I said it. It’s HEALTHY, because in that downpour, you are going to be cleaned and you are going to see the rainbow that is on the other side! You just have to have faith that you will get there. Nothing worth having is easy and NOTHING happens overnight. Hard work breeds success! Here are my wishes for you. May you continue to forge your own trail. Make you write love letters to the world. May you make bold choices. May you notice all of the wild miracles that surround you. May you face each new day with a raw heart and without expectations, ready to create the life and the comeback that your soul deserves. 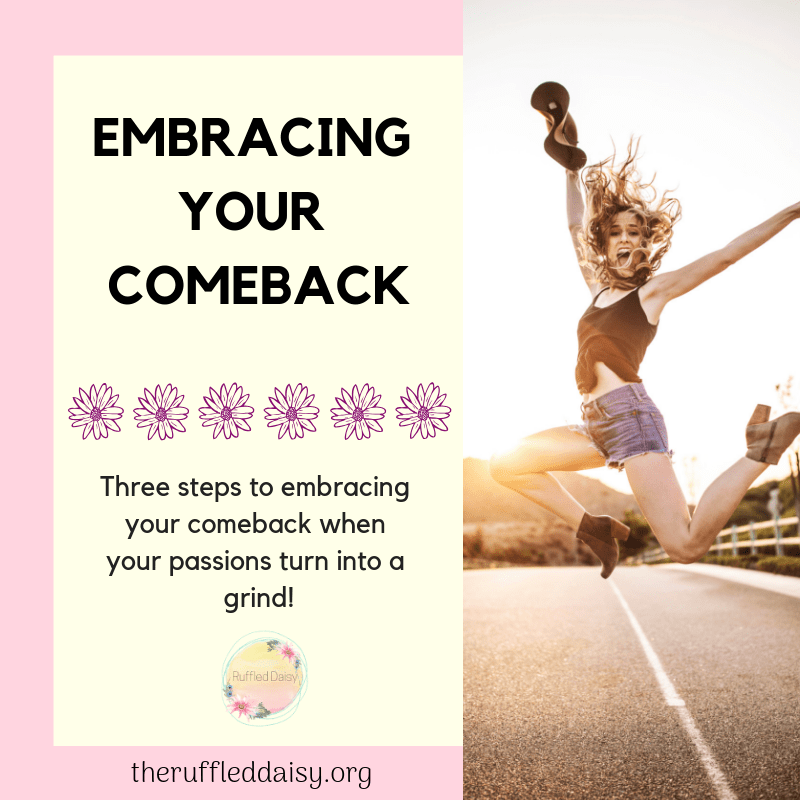 So the next time life throws you a curve ball and you don’t know whether to hit it or duck out of the way, start embracing your comeback! Don’t let it knock you down and get you off track. It’s time to get back to YOU! The YOU that you were created to be. The YOU that God breathed life into. The YOU that has amazing things to share with the world. The YOU that is going to understand your weaknesses and use them to foster your greatest strengths! The YOU that deserves a life of love, happiness, and passion. Because without passion, you truly aren’t living. You get to choose to create your life that is beyond your wildest dreams! 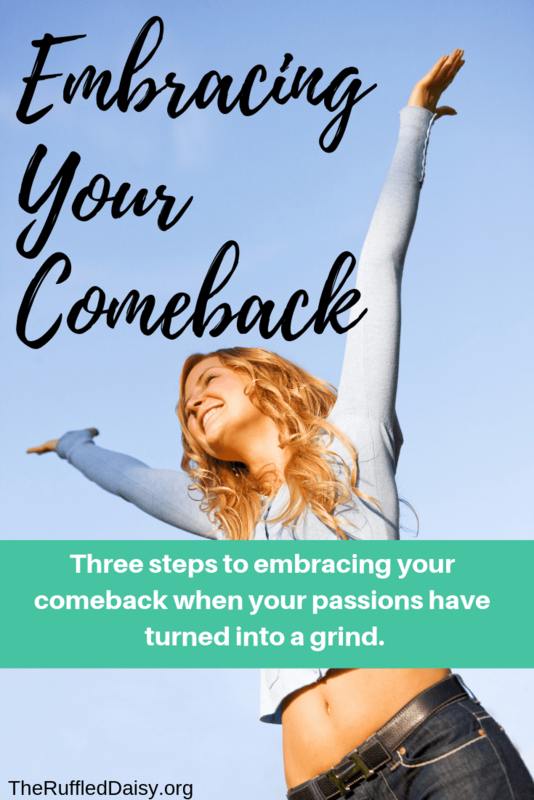 Have you need to embrace your comeback? I’d love for you to share it with your friends on social media and PIN it so you have it for later! If you like what you see on this page, I’d love for you to join my mailing list HERE! When you join, I’ll send you my FREE Home Decor Holiday Printables that you can immediately download. Just my way of saying “thank you” and encouraging you to live your best life! !